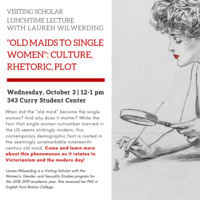 Join WGSS and Lauren Wilwerding for this Visiting Scholar Lunchtime Lecture! Food will be provided. When did the old maid become the single woman? And why does it matter? While the fact that single women outnumber married in the US seems strikingly modern, this contemporary demographic fact is rooted in the seemingly unremarkable nineteenth-century old maid. As Victorians worked out the roles appropriate to a large population of single women in journalism, conduct books, and life writing, a specific plot emerged for unmarried women focused on the choice to pursue meaningful work over marriage in literature. Moreover, this plot and its rhetoric are still at work in conversations about singleness and female labor. The project to expand the narratives of women’s lives requires acknowledging the long history of the single girl in the nineteenth century. Lauren Wilwerding is a Visiting Scholar with the Women’s, Gender, and Sexuality Studies program for the 2018-2019 academic year. While her focus is English, Lauren constantly incorporates women’s and gender studies into her work, because she sees the two as inherently related to each other. In Lauren’s research on women in nineteenth-century novels, the single woman emerges as a figure with uniquely and instructively particular relations to gender, marriage, work, and the form of the novel itself.